A luxury waterfront condo and parking garage development is on its way to the central Embarcadero, even though it would add three times the number of residential parking spaces allowed by law, plus 255 public spaces, to one of San Francisco’s most transit-rich destinations. 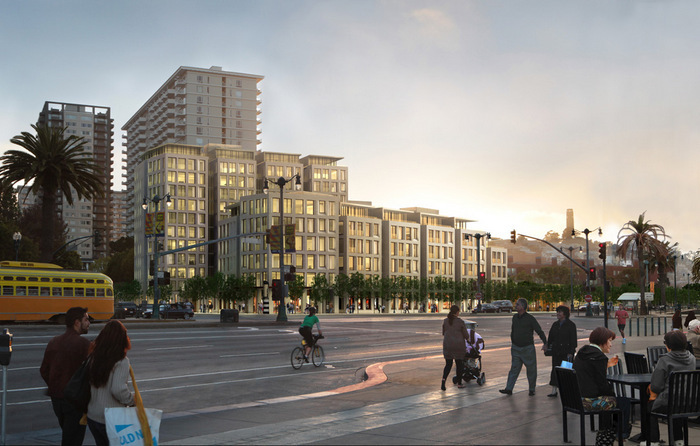 The SF Planning Commission approved the environmental impact report for the 8 Washington Street project in a 4-2 vote yesterday after a joint hearing with the Recreation and Parks Commission that lasted seven hours. The project must still be approved by the Board of Supervisors. The garage would include a parking spot for each of the 145 units (three times what the planning code permits) and 255 public spaces, which the Port claims are needed to replace other nearby parking being removed. The project would bring some park space and pedestrian enhancements, but the enormous underground public parking garage will wipe out any benefit by serving as a magnet for car traffic in an area that already caters too much to the automobile, even after its revitalization following the removal of a freeway. 8 Washington will be located within walking distance of numerous neighborhood amenities and transit lines, including Muni light rail and BART stations. Radulovich also noted that future transit projects like high-speed rail are poised to make it an even more ideal spot for reliable car-free travel. Jonathan Stern, the Port’s director for waterfront development, argued to the Planning Commission that the parking is needed for Ferry Building customers who drive to “carry large objects” and who compete with driving commuters for spots, also noting that the underground garage will be “out of sight.” The Port says that 961 parking spaces within a 15-minute walk of the building, including the 105-space parking lot currently located on the 8 Washington site, have recently been removed or will be removed in coming years. Advocates who’ve looked at the numbers say the Port’s parking supply analysis is severely flawed. Existing parking garages and lots in the area are poorly utilized, according to Radulovich, who says that more than enough parking would be provided by converting underused commuter parking spaces to short-term parking for Ferry Building visitors who drive, though that could be challenging to do in private garages. A 2005 study [PDF] by the SF County Transportation Authority found that despite “a perceived shortage” of parking in the area, off-street lots and garages were occupied at a rate of just 21 percent and on-street parking 70 percent. “This could be because some garages are less visible or in areas that less familiar to tourists,” the study says, “which implies that better driver information systems, even just better signage, would improve the parking situation today.” It also noted that luring drivers into garages with comparatively lower prices, as the SFPark program is currently doing, would help optimize use of the existing parking. As for 8 Washington’s residential parking, the developers argue that building nearly three times as many spaces as permitted is justifiable because the parking ratio is similar to the regulations for a nearby district. They propose to mitigate the impacts with public realm improvements like park space and new pedestrian connections to the waterfront. City agencies like the Port will also benefit from substantial fees and taxes on the property. Planning Department staff seems willing to let the exception slide, recommending only to reduce the number of spots to 126. But there was some dissent on the Planning Commission: Cindy Wu and Hisashi Sugaya voted against approving the EIR. Interesting that these people never think of how the vehicles get to and from the parking spaces. So wait, will the parking garage be underutilized like other garages in the area, or will it serve as a car magnet? My own hunch is the former, and it will serve as an excellent example for future projects. In DC, a major shopping center was built with hundreds too many spaces and is often touted as an example of the power of transit. If the massive garage will be a boondoggle, it will serve the transit community, not to mention developers, as an example of how not to do parking. The info about underutilized parking is there to debunk the perception that the existing amount of parking is saturated, which is being used as an argument for building more of it. That could theoretically happen with the new garage, too, if drivers are unaware of it or continue to be lured to street parking by lower prices. But it remains that the more spaces are built in that garage, the more residents will be encouraged to own and drive cars simply because the space is set aside for them. Meanwhile, more visitors will choose to drive than they would without it, whether they park in the garage themselves or in a street spot left vacant by someone else who did. I don’t get this anti-garage thing. You think people should _not_ be allowed to _pay_ extra for parking in what is a private setting, and yet you think people should have nearly free parking on what is public space. This nearly free parking on public space amounts to a subsidy to car drivers. I know of someone who lives on a street with perpendicular parking. They are renting out the space on the street in front of their driveway for $220 _per month_! That is the market value of a guaranteed street space. Garage space in my neighborhood goes for $350 per month. I think you go after private garages because you can. It is traditional for SF to beat up on developers. I think you don’t go after publicly subsidized spaces because you know it would never fly. The city can’t add a few additional meters down south, or add a bike land on Oak because a few of these spaces would be lost. Whatever. I don’t care one way or another about nearly free street parking, but it is a San Francisco joke to go after paid for private spaces when nearly free public spaces are taken as a right. Transit: I wonder if transit advocates actually ride it. It is filthy, slow, and crowded. If crowded is good, why are the seats arranged so stupidly? It is difficult to get on, and if you do, it is difficult to get off. Apparently crime is an issue. How can anyone who rides it not see these things? How can anyone who rides it think these things are Ok? If people have other options, why wouldn’t they use them? If the issue is money, how come so much is being blown on the Chinatown subway? I have head talk about a busway on Van Ness, back door boarding etc. but that sounds like too little too late. I’ve never heard any discussion about the layout of the buses. I was going to respond to this, but it quite the unintelligible rant. And renting a street space in front of curb cut sounds illegal. I’m not opposed to garage parking per se, but I think San Francisco should look at what happened with the DC USA retail development in Washington, DC. The parking garage goes mostly unused because of its proximity to rapid transit. The old ideas of parking needs are a bit outdated this side of the 21st century. I’m not sure what “large objects” people are carrying out of the Ferry Building, but it should be easy enough to have them delivered. To avoid a waste of money and space, they would be wise to include only as many spaces as would be needed for the condo building’s residents and guests. The next time someone quacks at me about “green” this and “sustainability” that and how SF “leads the way” I’ll just point them to this and other planning commission decisions that favor expensive luxury developments and make a mockery of the rhetoric about “middle class housing” and the like. Rich aren’t like the rest of us. They need their cars to haul their loot cause they have lots of loot to haul. You wouldn’t want them taking the bus to the opera in their diamonds and furs, or their kids alone on the Muni. That is why there is a variance for nannies. They need to chauffeur the kids around. I don’t really see the problem here. Instead of subsidizing street parking / public parking garages we have a private entity willing to pay market value on garage spaces for its clients. We, as supporters of public transit and walkability, should entourage the private sector, especially in a place like San Francisco, to invest in underground parking to free up street space for the people. Densifying development can only be a good thing in an urban setting. The car is not going away and nor is the need to find places to put it. While underground structures like the one proposed will create traffic problems at the entrances/exits… underground privately financed parking is a much better solution than street parking / complaining about people owning cars. The garage may be out of sight, but as @mikesonn:disqus pointed out early, those cars all have to get there one way or another. In the end, the problem isn’t just about the space taken by parked cars, but the fact that parking enables car usage in the first place. And it is the car usage that is the real problem. Sure, cars aren’t going away (though there usage will inevitably be restricted in the near future), but there is no need for every unit to have its own parking space, especially when there is plenty of space available in nearby garages. I don’t think that parking garages like this are ever going to go away as a feature of new buildings. They just won’t. Developers tend to be risk-averse and set in their ways. The developer would rather pay up front for the garage to be built, and then have it go underused than have their new development suffer if the parking available isn’t sufficient. Worst case scenario, the private resident-only parking can be converted to a public (pay) parking lot. Even if we make our cities into car-free paradises, you will still need a car to get around the other 95% of the country, so the idea that cars will somehow vanish under a torrent of BRT, light rail, and bike shares is a ludicrous fantasy. “Gee we’d love to visit Muir Woods or Port Reyes again, but BART and Muni don’t go there, so I guess we can’t ’cause we’re car-free now.” Not going to happen. What’s not sufficiently covered here is Port’s obligation to provide parking under lease agreements with Ferry Bldg office tenants, reserved spaces that are part of the 255 planned. And while you’re arguing about parking, no one’s mentioning the return of public property when the now-private tennis courts are eliminated. Currently fenced off, Jackson Street will once again open to the Embarcadero, not as a street, but a pubic plaza. Oops. Sorry about “pubic.” Public!